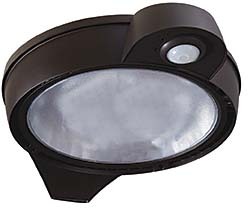 TopDek deck/surface lot luminaire features optic configuration for glare control, field rotatable optics, integrated houseside shield, concealed heat sink, and daylight and occupancy controls. The fixtures use replaceable high-brightness ANSI 4000K (65 CRI min. ), 5000K (65 CRI min. ), and 5700K (70 CRI min.) white LED array.